Not impressed with Apple’s half-baked Maps app for iOS 6? Well, good news: an official Google Maps app just landed in the App Store, complete with Google’s comprehensive map data, Street View, turn-by-turn driving directions, and more. 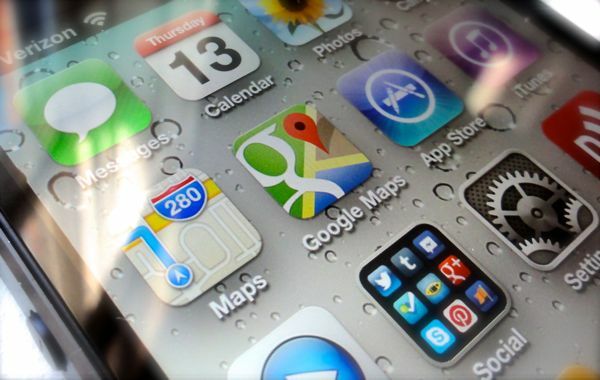 You can download Google Maps for iPhone right here; a version for iPad is coming soon, Google promises. The eagerly awaited Google Maps app brings with it a pair of key features missing in Apple’s maps app: the eye-popping Street View mode, and public transit directions. And with Google Maps on your iPhone, you’re more likely to steer clear of the spotty directions that have plagued Apple’s troubled mapping app. But while it’s certainly a relief to have Google Maps back on the iPhone as an actual application (as opposed to a basic mobile-web version), the app does have its fair share of oddities and quirks, and it doesn’t always play nice with the other apps on your iPhone. 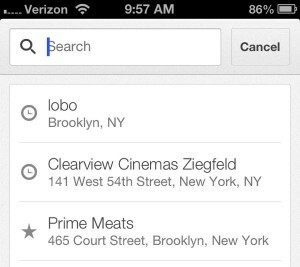 Google Maps for iPhone will remember all your previous searches, including those from the web. Did you sign in to your Google account when you first launched the app? If so, tap the search box at the top of the Google Maps interface to see all your most recent searches, including those you made on the web. Google Maps for iPhone will also remember any addresses, businesses or other locations you’ve “starred”; to access them, tap the profile icon (it’s the one that looks like a human profile, just to the right of the search box. While Google Maps can find practically any location on the planet through the search box, it won’t be able to look up the addresses of friends, colleagues and loved ones saved in your iPhone’s address book. For that, you’ll have to go back to Apple’s Maps app. While Apple’s new Maps app will dial up turn-by-turn driving and walking directions, it’s no help when it comes to buses, subways, or other public transit systems. 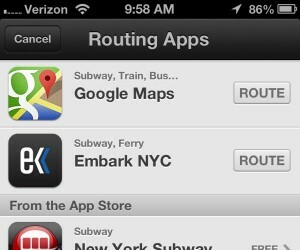 Apple’s Maps app will hand you off to Google Maps if you’re looking for transit directions. The good news, though, is that Apple Maps will now send you straight to Google Maps if transit directions are what you’re after. Just search for an address in Apple Maps, tap the blue arrow next to its name, tap “Directions to Here,” select the public transit tab (it’s marked with a bus icon), and tap the blue Route button. Once you do, Apple Maps will show you a list of apps that support public transit directions, including Google Maps. Tap the Route button next to Google Maps, and the Google Maps app will open with its own set of directions; tap the bus icon at the top of the screen for public transit options. You can also get walking directions or voiced, turn-by-turn driving directions, just like in the Apple Maps app. 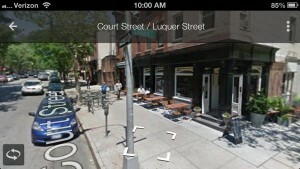 Yes, Google’s interactive, 360-degree “Street View” panoramas are back on your iPhone thanks to the new Google Maps app. Google’s fabulous Street View mode: back at last. Also, here’s a nifty trick while using Street View: see the button with the curly arrows in the bottom-right corner of the screen? Tap it, and you’ll activate “compass” mode, which uses the iPhone’s internal motion sensors to orient Street View’s vantage point in the direction you’re facing. If you’re facing north, for example, your Street View image will face north, as well. Neat. Even if Google Maps becomes your mapping app of choice for the iPhone, Apple Maps will remain the iPhone’s default maps app. So, what does that mean? Well, if you find a restaurant in Yelp and tap its address, your iPhone will open Apple Maps, not Google Maps. Of course, it’s always possible Apple will let us change the iPhone’s default mapping app in a future version of iOS; for now, though, no dice. 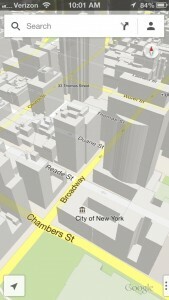 Swipe down with two fingers for a 3D-like map view, complete with 3D buildings. Swipe from right to left with two fingers to reveal a hidden panel of options, including adding “layers” of map info for traffic conditions, satellite imagery, and public transit maps. Or, try this: swipe down with two fingers to tilt the map for a 3D-type view, including 3D buildings of metropolitan areas in cities like New York and San Francisco. Did Google Maps point you in the wrong directions? If so, shake your iPhone; when you do, a pop-up will appear with links for sending feedback to Google. Got more questions about Google Maps for iPhone, or a tip you’d like to share? Let us know in the comments below.